Yum! I will definitely try this!! I peel and cut my potatoes. Put them in the crockpot covered with water and let them cook. I put them on high overnight. But we eat at 9:30|10. They need 8 hours or so for a 10lb bag. Then I mash them right before we eat. Fresh potatoes when we are ready! I use the method everytime I make mashed potatoes. I did this last year – cooked them in the crockpot overnight to Thanksgiving day, then just mashed and kept them warm in the crockpot. i thought they came out more flavorful than if I had boiled them. I’m definitely dong this again this year, and going forward. Did they stick to the pot or were they fine being warmed for a lot of the day? Wow! Between Laura’s make ahead and put in water trick and your comments, potatoes will never be easier! Since I bring them to my MIL’s each year in the crockpot, this saves the transfer and only one pot to wash! Can’t wait to try this!!! Woo HOO! The first on you list, peeling, chopping putting in water and leave it. Do you put it in a pan in the fridge? A glass bowl? If I peel and chop the night before, I don’t understand how to store them . Good tips! Thank you, Laura. I haven’t tried making and freezing them, but these look good! I’ve never tried making them ahead of time! I like the idea of doing all the prep the night before and then just turning on the burner when ready to make them. I have only done hash brown style diced potatoes. This recipe is fantastic! I have frozen mashed potato and like you, thought they looked really watered down. However, by the time they finish reheating, they tasted almost normal. I found we prefer to bake it in the oven and it was more like a twice baked potato. We use the crockpot method to keep them warm. It frees up oven and stovetop space which helps a lot. Yep, this is what we do too. So much easier! I like the crockpot, but I butter it and pour in whipping cream…maybe 3/4 cup and then add the freshly made mashed potatoes. Keeps them moist and doesn’t scorch the outside of them. Also, salt the water you boil them in. I have had good success freezing the embellished mashed potatoes. Such a time-saver! We love the crockpot method; it even allows mashed potatoes to become something you can bring when someone else is hosting, and best of all – frees up stove space! Love the cheesy mashed potatoes! Any suggestions for a dairy free make ahead mashed potatoes? I have had wonderful results with making mashed potatoes the day before and reheating them in the crockpot. But I learned a lesson from the first try at this. #1 don’t add quite all the milk to desired consistency. Leave them a little stiff, allowing for the moistness that accumulates on the inside of the crockpot lid. You can always add milk or chicken broth later if needed. #2 place either 1 or 2 layers of paper towels over the top of the crockpot before putting the lid on. The paper towel absorbs the excess steam water. I then heat on low for 3-4 hours or as needed. Works like a charm. No sticky or gooey glob here. I’m making mashing mine in the crockpot now and will bring to my MIL’s all day. Thanks for the tips! Homemade mashed potatoes have always intimidated me…. too many times as a kid I heard complaints about someone’s lumpy mashed ‘taters! Scarred me for life. Guess I’ll have to put aside my fear of failure and give these tips a try ;-) They have to be better than the Potato Buds my hubby was raised on. Sounds delicious! And such a time saver. I bet even my little ones will eat these mashed potatoes! Boy-oh-boy! I may not make it to the holidays. That picture of cheese on the taters just looks absolutely delicious!! Cannot wait to try it! I’ve never made mashed potatoes ahead of time. In fact, I’ve only made mashed potatoes a very few times! But my family loves them, so I will give it a try this year. I like the crocked pot method. These sound lovely. Haven’t ever tried making tators ahead of time, but sounds very doable. Thank you for the recipes and tips. Some experiences were good and some not so good ???? 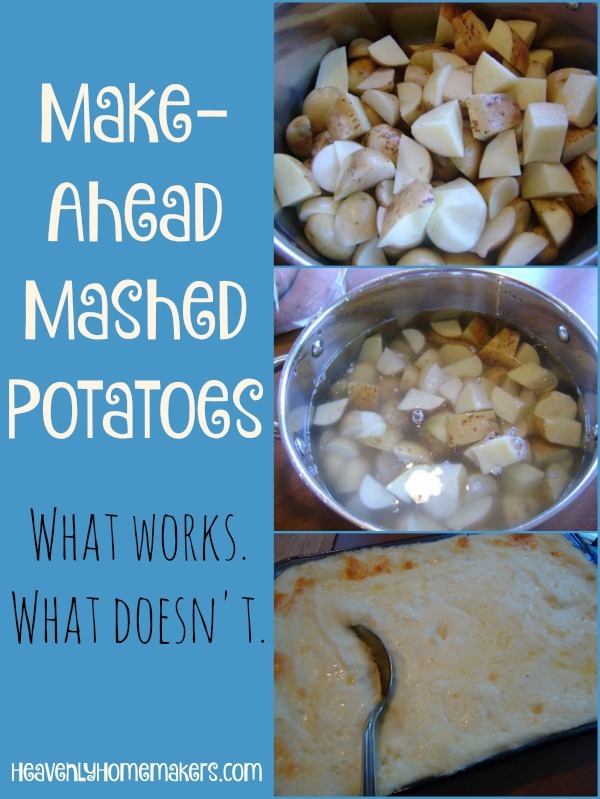 We love mashed potatoes and with all these tips, I ought to be able to perfect my method! I will have to try #1 on regular days to get some dinner prep done early. Thanks for the ideas! We make our potatoes ahead of time and freeze them every year. They always turn out great and everyone loves them! I’m psyched to try this out but am starting to wonder– what will I do with all my extra time on Thanksgiving day? I love to make mashed potatoes in the crock pot! The cheesy mashed potatoes sound good! I’ve also heard that adding cream cheese will make mashed potatoes freeze well. I do like the prepare overnight and cook in the crockpot the next day ideas. I think I will do the crockpot mashed potatoes. Or mashed cauliflower cheesy casserole, unless I get two stove tops in the next three weeks, which is extremely unlikely. I think we are just doing Turkey breast and ham. !!!! So excited to have thanksgiving dinner in my new house! But a little sad because we always went to my mother in law’s and she passed away in February. When our huge bag of potato starts to sprout I make up a few huge batches of mashed potatoes and freeze them. They seem watery and broken when thawed, but are fine when they are reheated. 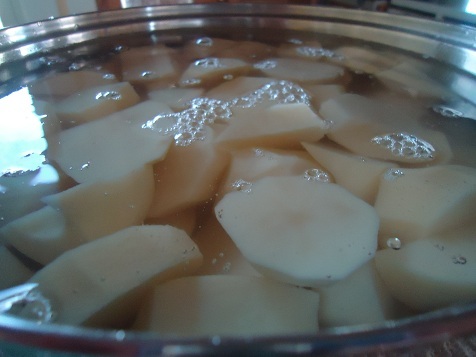 And when I do the big batches up I use the water and a few potatoes and make soup….waste not, want not! We LOVE potatoes around here! Mashed potatoes is my husband’s favorite food. If our freezer was full of them he would not be disappointed! 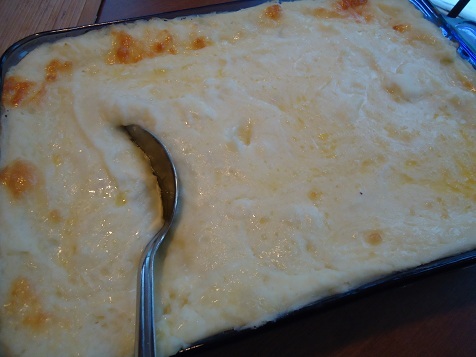 I’ve made a similar cheesy mashed potato recipe the night before and they heat up in the oven wonderfully. I’ve never tried freezing them, but even making them the night before helps ease the stress on the big day! I’ve read in other places about adding cream cheese to mashed potatoes before freezing them, but your way sounds lot better to me, Laura. I can’t wait to try it. Thanks for the tips on potatoes. I always make my mashed potatoes a couple of days in advance, but I’ve never tried freezing them. My recipe calls for cream cheese and I always warm them in the crock pot for a few hours on low. My “Day Ahead Mashed Potato” recipe calls for cream cheese as well. I boil 5 lbs of potatoes, then mix in 1 package of cream cheese and 1/2 cup of milk with a hand mixer till smooth ( may need up to an additional 1/2 cup scalded milk). Then I pour it into a glass Pyrex dish and viola, potatoes ready to re-heat in the oven alongside my meat the next day. Especially nice since I don’t own a crock pot. 2 part dairy to 1 part potato, that’s my kind of potatoes! These looks really yummy. I hadn’t considered making them a few days ahead before. Thanks for sharing all these great tips and recipes. I’m excited to try your make ahead method this year! Thanks! 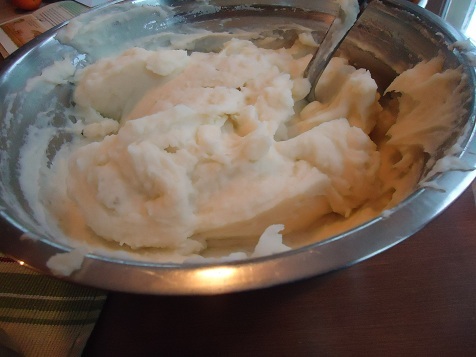 I never knew you could freeze mashed potatoes ahead of time – thanks for all of these tips!